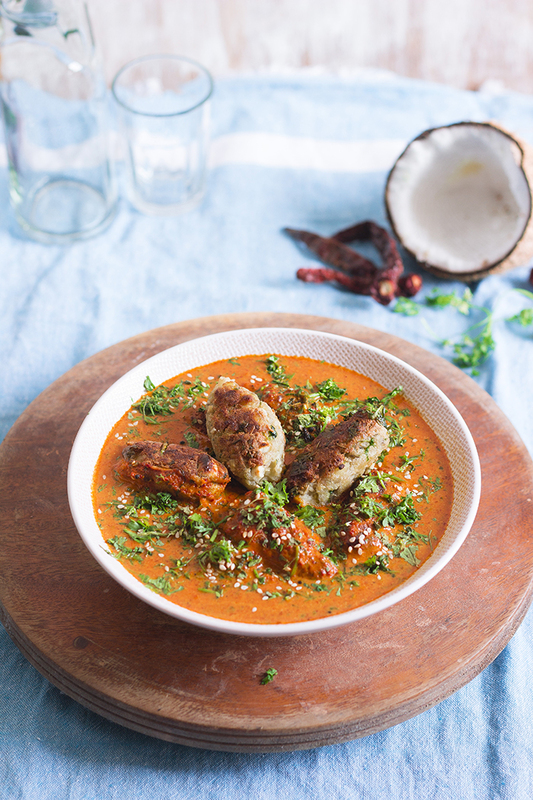 Raw Banana Kofta Curry is a spicy, sweet and tangy coconut based curry with fried raw banana (plantain) dumplings. 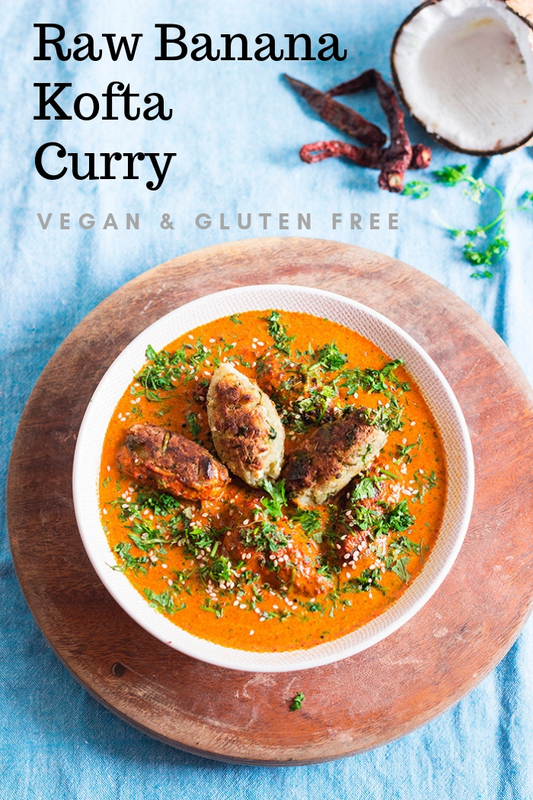 This curry is vegan and gluten free. We are mid way through January already!! I must say, time literally flies. It feels like just yesterday it was December and I was getting all excited for the New Year, and today we are already well into it. So did you start all that you planned to do in 2019? I'm still dragging my feet on my checklist. In other news, I've been at home an awful lot lately, mainly because of some trade union strikes last week that stopped public transport and we were all forced to work from home, and I had some personal commitments that made me still work from home for a few days here and there. While you would think being home and cutting out all that stress of travel, I'd be more productive in the kitchen. But the truth is, when I'm home I'm super lazy. Sometimes, I make instant noodles or just buy bread to mop up leftover curry. 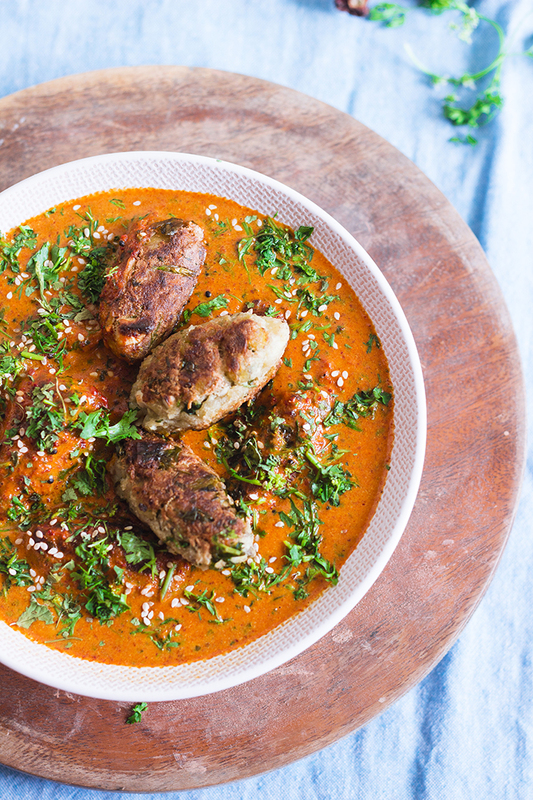 I finally decided it was time to stop being lazy and cook up this amazing Raw Banana Kofta Curry that I had in my mind for so long. I found this recipe in a magazine at the doctor's. I actually dread doctor visits. I can probably count the number of visits I've made in the last 2 years on the fingers of one hand. Raise you hand if you dread doctor visits like me! While I waited for my turn for my annual checkup, I leafed through a magazine on the coffee table and this recipe kind of jumped at me. I made Raj take a quick photo and stored it away. Finally I got around to making it, thankfully. 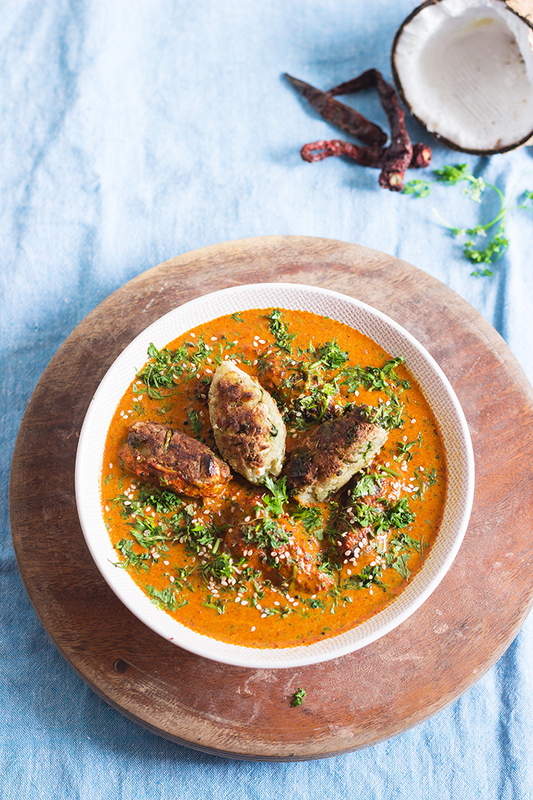 This Raw Banana Kofta Curry is spicy, sweet and tangy! Flavor explosion in your mouth. The curry or the gravy is what gives all the flavor. Tomato and Tamarind impart the sourness to the curry, the jaggery adds sweetness, the high count of red chillies gives the curry heat and color and the coconut milk just mellows down everything with it's rich creaminess. My mouth still waters when I reminisce about this curry, it was SO delicious. This curry really had the balance of sweetness, sourness and heat. Take the ingredients below as more of a direction than rigid quantities. Your palate may prefer the curry being less sweet and more tart. Adjust the ingredients to your liking. 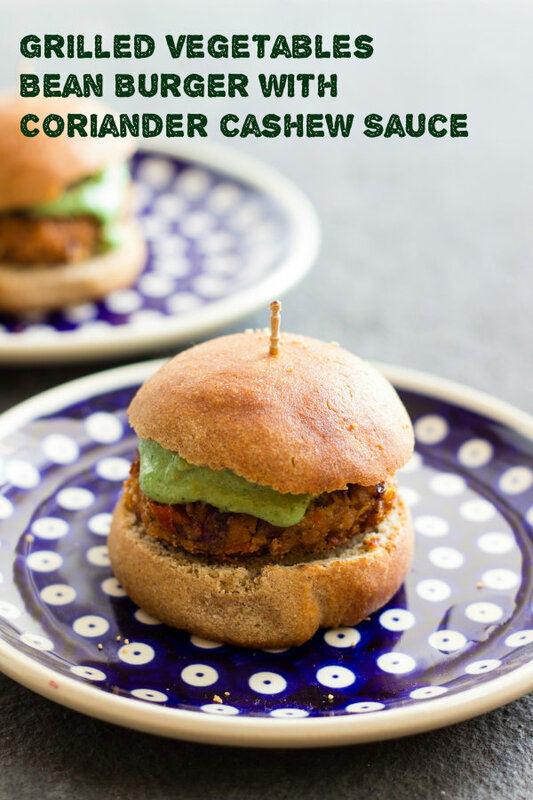 Start with less jaggery and tamarind and add more as you go along. The red chillies are deseeded so that the curry is not too hot but still has the vibrant color. You can leave the seeds in for a spicier curry. The Raw Banana Koftas are really easy to make. They taste good just by themselves too. So you can make more and serve them as snacks at tea time. The original recipe called for raisins but I replaced them with cashew nuts. Add any nuts you like into the koftas. I also added in grated Tofu instead of the grated Paneer, because I had tofu in the fridge. 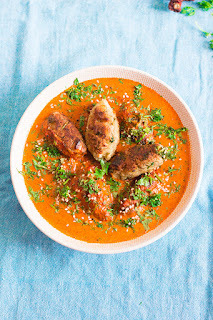 The koftas can be either shallow fried or deep fried. You may even try to bake it. Add the koftas just before serving to retain the crispness of the koftas. 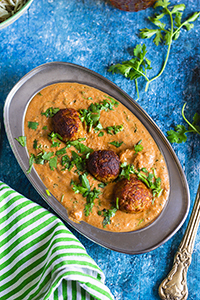 Raw Banana Kofta Curry is best served hot with naan or rotis. 1. Cut the edges of the raw bananas and dice them roughly. Boil them with a pinch of salt until soft. 2. Peel the bananas and keep aside. 3. Deseed the dry red chillies and add to a mixer/blender. You can keep the seeds in if you want the curry to be very spicy. 4. Add turmeric powder and black peppercorns to the mixer and grind until you get a coarse powder. 5. Add 2 tsp of jaggery or sugar along with the tamarind pulp and chopped tomato to the blender. 6. Add a little water and blend until you get a smooth paste. 7. Heat oil in a pan and add in the mustard seeds. 8. Once they splutter, add the masala paste and cook for 7-8 minutes until the raw smell disappears. 9. Add 1 cup of water and a little salt and allow the curry to boil. 10. Once the water has evaporated, add in the thick coconut milk and allow it to come to a boil. 11. Adjust salt and sugar as required. 12. Once the curry has reached a rolling boil, add in the dried kasuri methi. 13. Allow it to simmer for 3-4 minutes. 14. Remove from heat and add in chopped coriander leaves and keep aside. 15. Mash the boiled raw bananas and add in the chopped cashew nuts, grated tofu or paneer, chopped coriander leaves and salt. 16. Mix well until combined and shape into koftas. 17. Heat oil in a shallow pan for frying koftas. 18. Add the koftas to the pan and fry until all sides are browned. You can also deep fry the koftas. 19. Add the koftas to the curry and mix well. 20. Serve hot with rotis or naan. Fresh tender Cashew Nuts!!! 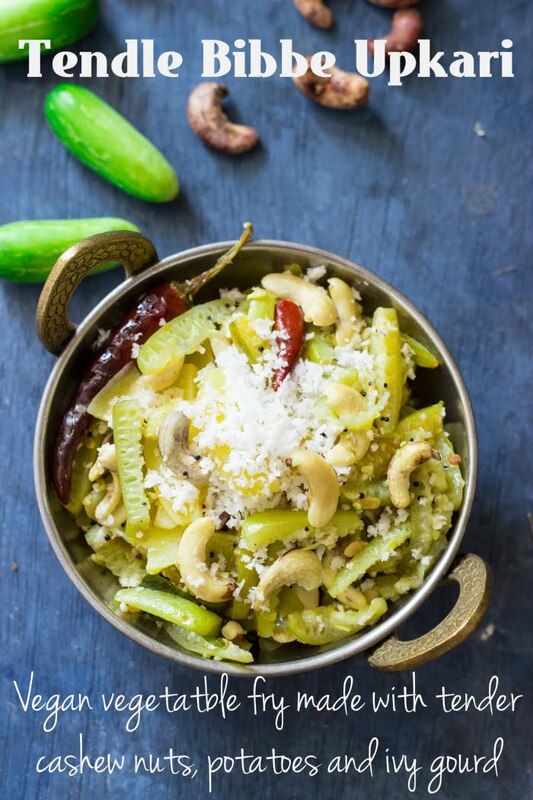 This Konkani new year dish lets you enjoy the creamy tender nuts in a mild fry with ivy gourds and potatoes. Fresh Cashew Nuts!! I cannot believe I was oblivious to their existence. Being Goan, my love for cashew nuts is obvious. But until today, all I had was dried cashew nuts, sometimes salted, mostly plain, sometimes flavored and once or twice, I have mustered courage to eat the fruit that causes throats to itch. Somehow, I totally missed getting on the fresh tender cashew nuts wagon, until now, of course. My friend Vindhya of A Million Morsels, introduced me to this tender creamy crunchy delicacy. So when Raj went to Karkala for an extended vacation for Ugadi (Hindu New Year), he got me these tender cashew nuts or bibbo/ bibbe. They are sold in packets of 50 or 100 and are very seasonal. They are usually sold around Ugadi as this Tendle Bibbe Upkari is a specialty for Ugadi in a Konkani household. If you cannot find tender cashew nuts, you can replace them with dried cashew nuts that have been soaked in water overnight or for 4-5 hours until they are nice and soft. Upkari is a simple palya or a dry vegetable curry. It is also super healthy, low on oil, high on seasonal ingredients, barely any spices. 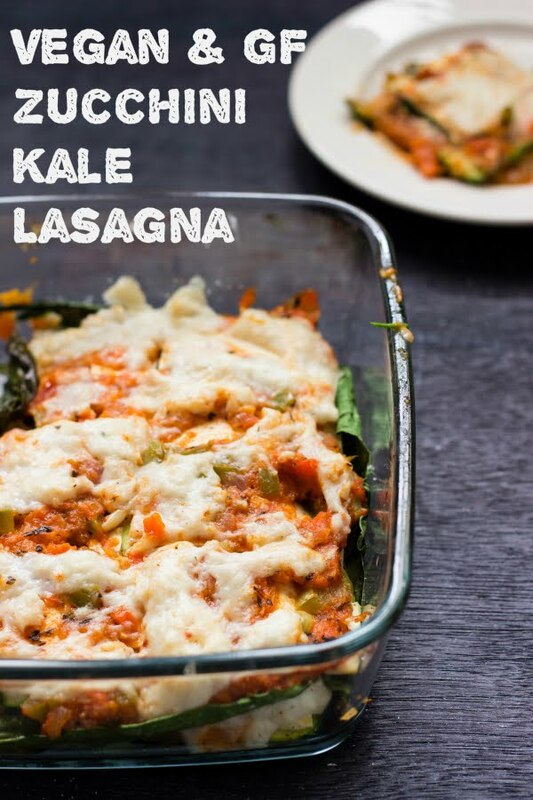 It is a refreshing fresh dish fit for Summer. Tendle or Tendli / Tondekayee or Ivy gourds is the fruit of a creeper. Tastes best when harvested when they are raw and tender and green. As they ripen, they become red and soft. Ripe tendle can be used to make Tondekayee Chutney. My luck shined when Raj got me home grown fresh tendle from Karkala. I am a big fan of anything home grown and organic. The tendle he got me were so tender and cooked so quickly. They were delicate and crisp, just the way I love them. Potatoes, you can add them or you can leave them. Sometimes, if one cannot find tender cashews or not enough of them, the quantity of the upkari is increased by adding more potato. I put them in as everyone loves potatoes. Coconut, another homegrown ingredient in my cooking. I feel so lucky to get homegrown coconut. I don't grow them in Bangalore, but every time someone comes from Karkala, my mother in law makes it a point to send me coconuts grown at home. They are huge, sweet and juicy.. YUM!! The coconut here is much more than just a garnish, it is almost the heart of the dish that brings everything together. This Tendle Bibbe Upkari has very little in the way of spices, just mustard seeds, urad dal and red chillies with a sprig of curry leaves. It uses very little oil, it is mostly cooked in water. As I said, it is very healthy. Tendle Bibbe Upkari is eaten as a side along with rice and dal or with chapati. Tondekayee Chutney - Chutney made from ripe ivy gourds or tendle and coconut. Saasav - Ripe mango curry from the Konkan coast. Banana Blossom and White Peas Curry - Dry curry made with banana flower and dried white peas. Tendle Bibbe Upkari is a Konkani vegatable dish made with fresh tender cashew nuts, tendle or ivy gourd and potatoes. It is usually made during Ugadi. Boil 2 cups of water. Remove from heat once it comes to a rolling boil. Soak the cashew nuts (bibbe) in the hot water for 1 hour. This will help loosen the skin. Peel the thin brown skin of the tender cashew nuts. Wash the cashew nuts thoroughly and split them into halves. Cut the tips of the tendle and slice it into thin slices. Heat oil in a kadhai and add the mustard seeds. 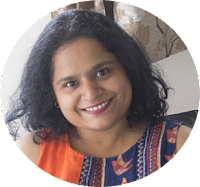 Once the mustard seeds splutter, add the urad dal, curry leaves and the dry red chillies. Fry until the urad dal changes colour. Add the sliced tendle and 0.5 cup of water. Cover and cook until the tendle are half done. Add the sliced potato and the tender cashew nuts. Cover and cook until the potato and tendle are done. Have you ever tried Hyderabad's famous Karachi Bakery Fruit Biscuits? No? I suggest you go get yourself one packet right now, girl. Yes? Aren't they super delicious? I absolutely love them... So I made them at home... Really!! Read on! I had no idea I liked Rose flavored cookies until I tried the Karachi Bakery Fruit Biscuits. A colleague once got them from Hyderabad and I missed the first batch. Just to make up to all those late comers like me, he got more the next day. And I was converted!! Until then I thought I was a lover of all things chocolate, but rose suddenly rose to the top (hee hee... see my little pun there? okay, ignore it). I absolutely love roses, not generally as a flower, I find them "meh" and over rated. But I love rose flavor! I'm all for Rose Faluda, Rose Lassi, Rose Ice cream and of course anything with Gulkand in it (Indian Rose Jam). And now Rose Cookies are added to the list. I'm sorry that although the title says Fruit Biscuit, all I'm talking about is roses. While the biscuits or cookies have little bits of fruit in them, rose is the predominant fragrance and flavor in them. The fruit component of the biscuit is Tutti Fruiti. Tutti Fruiti are colored sweetened bits of dried papaya. Very popular in Indian desserts. If you cannot find it anywhere, you can add any dried berry like cranberries. Actually, this recipe is very similar to the Cranberry Cookie recipe with the addition of few very Indian ingredients. One of those ingredients is the Vanilla Custard Powder. Traditionally custard is made with egg yolks, but ask any Indian how to make custard (well, almost any) and he/she will show you a little carton of Custard Powder that is completely eggless and allows any vegetarian to enjoy the flavors of a custard. There are several brands and flavors available, and while you can use any brand, I strongly recommend sticking to the vanilla flavor. If you cannot find custard powder, replace it with either milk powder or corn starch /flour. If using sweetened milk powder, remember to reduce the amount of powdered sugar used, else you may end up with a super sweet biscuit. My recipe of fruit biscuit is a very simple recipe that any baking newbie can make. You start by creaming together butter and powdered sugar. I cannot emphasize the importance of room temperature butter enough. To get the right consistency of the dough and eventually the biscuit, you have to have butter at room temperature. Salted vs unsalted is a whole other argument. I've always used unsalted butter in baking so I cannot comment on how salted will work in this case. I assume they have the same texture, but using salted will just add a little saltiness to your biscuits. Whisk the butter and sugar until the butter is white, soft and fluffy. Then just add all the flours, tutti fruiti, cashew nuts, milk and rose essence and knead until combined. Shape into logs or into a large rectangular block like I did. Wrap it in cling wrap and store in fridge to harden a little. This just makes it easier to cut and get even shaped biscuits. Bake at 180 degree C until the sides are slightly brown. Cool completely before storing in an air tight box. They will last you easily for 1-2 weeks. I really did not get any time to test the shelf life as these were over by day 4. I can assure you the flavor of these biscuits is spot on with the Karachi Bakery Fruit Biscuits. The texture is slightly different. Mine were not as flaky and crumbly as the bakery ones, mine were more dense and crunchy. This could be because I have not used any leavening agent like baking powder or baking soda. My family loves crunchy biscuits that stay intact when dipped in tea over the crumbly ones, so we loved the texture. If you want softer ones, I suggest adding a little baking powder to a small batch of dough and seeing how it goes. Almond Cookies - Easy to make eggless almond cookies / biscuits. Butter Cookies - Beautiful swirly eggless butter cookies. 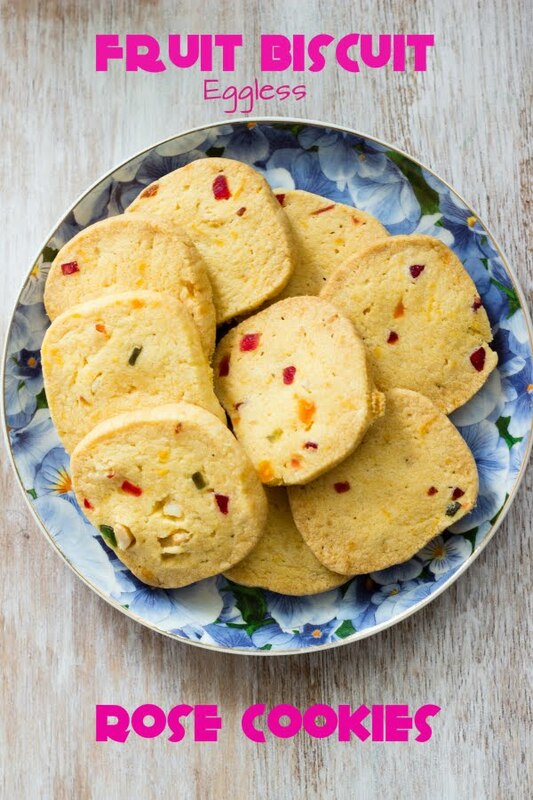 Karachi Bakery inspired Fruit Biscuits are rose flavored biscuits or cookies made with dried papaya pieces called tutti fruiti. Cream together butter and powdered sugar in a large bowl until soft and fluffy. Around 5-10 minutes with a electric hand mixer. Sift in the all purpose flour and custard powder. Add tutti fruiti, chopped cashew nuts, rose essence and milk. Gently roll into logs using your hands and wrap in plastic cling wrap. Refridgerate for 2-3 hours until stiff. Slice the dough into biscuits, about 5-6mm thickness. Line the baking sheet with butter paper or parchment paper. Place the biscuits on the sheet leaving enough space between the biscuits. Bake for 20-25 minutes until the sides are slightly browned. Store in an air tight box. I did exactly what I have been doing since I was probably 8-9 years old. We all gather around the TV at 9am, turn on Doordarshan and watch the Republic Day Parade. Times have changed, I've moved from a 12 channel TV that actually just had one station to telecast to one that has so many channels I lose the count, but the Republic day tradition remains unchanged. And I realised, it is not just in my house, but a lot of people of my generation still continue the tradition started by our parents. Time stands still at the Amar Jawan Jyothi, eyes mist up when the President honors the soldiers with Ashoka Chakra and the chest swells with pride when the Armed Forces walk by in absolute synchronicity. Then come the fun floats with each state showcasing it's highlights. I loved Goa this year, such a peppy song being played. Then are the dances from children, stunts on bikes and the air force display. Of all the year I've watched, this year's bike stunt - especially one called the Christmas Tree gave me goosebumps!! What a lovely show it was... melancholy, patriotism, pride, happiness, awestruck - all these feelings in a duration of less than 2 hours. With all those emotions in me, I really wanted something simple for lunch today. Simple to make and simple in taste. This Ghee Rice felt perfect for the moment. Ghee is to Indians what butter is to the French. Most Indian households will have a jar of ghee, mostly homemade, and sometimes store bought. Although ghee is indispensable to most Indian sweets, it has a special place in savory cooking too. Ghee is smeared on rotis, ghee is drizzled over rice, some people even add a tempering of ghee to curries. Ghee holds such a revered place in our lives that every festival meal served on a Banana leaf begins only after Ghee has been served. Ghee Rice is best served with a simple dal. 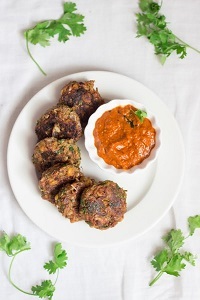 Try out this restaurant style Dal Fry or this mixed lentil Pancharangi Dal. Mushroom Biryani - Basmati rice cooked along with whole spices and mushrooms. Ginger-Garlic Vegetable Fried Rice - Vegetable fried rice tossed in ginger-garlic sauce. Vangi Bhaat - Rice cooked with brinjal or eggplant and a few spices. 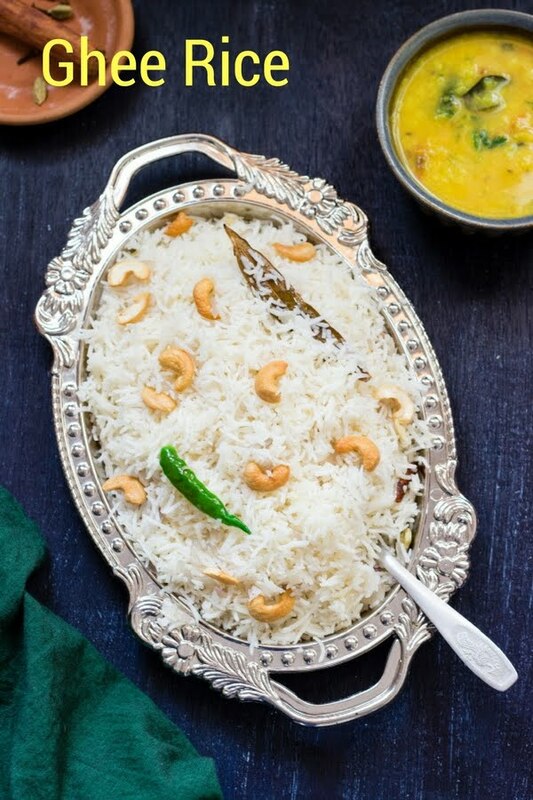 Ghee Rice is a simple Indian rice dish where Basmati rice is cooked in ghee or clarified butter. Wash the basmati rice until the water runs clear. Around 5-6 times. Drain and keep aside for 30 minutes. Split the cashew nuts and add to the pan. Roast them until they are golden brown, then remove from the ghee and keep aside. Add all the whole spices to the ghee and fry for 45-60 seconds on low heat until fragrant. Add chopped onion and slit green chilli. Fry until the onion is translucent. Add the rice and toast it gently for 30 seconds. Add water and salt. Cover and cook on low to medium heat until the rice is cooked. If all the water is absorbed and the rice feels undercooked, sprinkle 1-2 Tbsp water and cover and cook on low heat until rice is done. Allow it to cool a little before fluffing it with a spoon. Serve hot/warm along with dal. I hope you had a great New Year's Eve!! I ended 2016 with a sweet note. Read about it here. In our culture, we start everything new with something sweet. I'm starting the new year with this sweet treat - Vermicelli Pudding or Semiyan Kheer or Shavige Payasa. Not that I need excuses to eat desserts, but then it is January, and I have resolutions made that I don't want to break in the very first week. So, I just had one little bowl. But what a bowl it was, rich, sweet, fragrant, everything a kheer is meant to be. Shavige Payasa is very commonly made for all festivals and is what we begin the meal with. It is one of the easiest desserts I know to make. The second step is the dry fruits. I am a total "nut-case", I love nuts and dry fruits. I am extra generous with nuts and dry fruits when it comes to desserts and I also like to add a variety of them. This time I've used almonds, cashews, raisins and pistachios. The nuts and dry fruits need to be chopped and fried in ghee as well. Again, you need to be careful while frying in ghee. Ghee heats up quickly and you can end up with burnt nuts. So keep a watch on them. Stir frequently and keep the heat low. Fry the raisins separately as they burn quickly. After this you are pretty much done with the "work". Just boil milk, add sugar and the roasted vermicelli. Give it a good stir to separate the strands of vermicelli and then allow it to simmer on low heat until the vermicelli is cooked completely but still retains it's shape. The vermicelli will give way when squeezed. About the sugar, I'd say start with less and add more if required later. Add around 3/4th the quantity in the beginning and you can add more after the vermicelli is cooked. Somehow, a lot of people think Indian Desserts are way too sweet and avoid them. But when you make it at home, you can adjust how much sugar you add depending on your taste. So Indian desserts don't have to be sickly sweet. Once the vermicelli is cooked and the sugar adjusted, add the cardamom powder and the fried nuts and dry fruits and mix well. If you have over reduced the milk and the kheer begins to look thick, add more milk and adjust the sugar. Shavige Payasa is usually served hot to warm, but I like it at room temperature. I enjoy it even when it is cold. Chana Dal Payasa - Kheer made from chana dal and coconut milk. Gajar ka Halwa - North Indian carrot pudding made with grated carrots, milk, sugar, ghee and dry fruits. 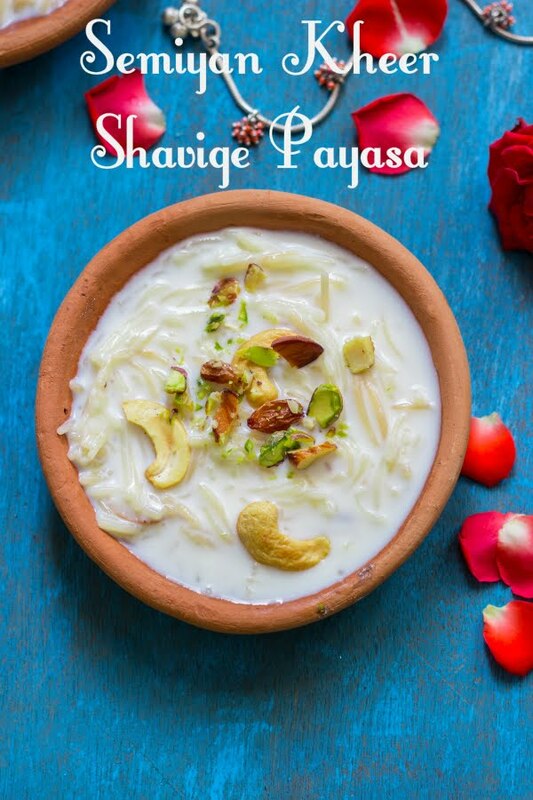 Shavige Payasa | Semiyan Kheer | Vermicelli Pudding is a simple Indian dessert made by cooking ghee roasted vermicelli in milk. Chop the almonds, cashew nuts and pistachios. Heat ghee in a kadhai and add the chopped nuts. Fry them until they are a gentle brown. Do not allow them to burn. Keep stirring. Remove the nuts and keep aside. Add the raisins and stir fry them until they puff up. Remove and keep along with the nuts. Add the vermicelli to the kadhai and on low heat roast the vermicelli until it is golden brown. Keep stirring frequently. Remove from heat and keep aside. In the same kadhai, add 4 cups milk and bring it to a rolling boil. Lower the heat and add sugar and simmer for 1 minute until the sugar dissolves. Add the vermicelli to the milk and on low heat allow it to simmer until the vermicelli is cooked. Stir occasionally so that the vermicelli does not form lumps. The kheer is done when the vermicelli is cooked. At this point if the kheer looks very thick, add the remaining milk and you can add more sugar and cook it until the sugar dissolves. Crush the cardamom into a powder and add to the kheer. Simmer for 1 minute after mixing well. Add the nuts and raisins and mix well. Remove from heat. Kheer is usually served hot, but you can serve it at room temperature or even cold. As the kheer cools it ends up thickening. You can add a little milk to loosen the kheer while serving. You can add powdered sugar to adjust the sweetness as well.